Gilgamesh is the first hero of Western literature. All our heroes since have borrowed his virtues: courage, loyalty, selflessness, and unwavering dedication to a goal. In this third and final book of the Gilgamesh epic, Gilgamesh sets out to find immortality. After many battles with monsters and scorching deserts and seas, he discovers that true immortality lies in the good he has accomplished during his lifetime. For those who love sagas, myths, and epic stories, this triumvirate is a must. Zeman has produced a spectacularly illustrated three volume picture book series of one of the oldest know stories. It begins with Gilgamesh the King in the ancient city of Uruk. Gilgamesh is a tyrant who is changed through his friendship with Enkidu and the beautiful Shamhat. When she is killed by the monster Humbaba, the two friends set out to avenge her death in The Revenge of Ishtar. After slaying the monster, Ishtar claims she had helped and asks Gilgamesh to become her husband. He rejects her and she wreaks havoc on the city of Uruk. Unable to kill Gilgamesh, she takes her revenge by bringing on a fatal illness to his beloved friend Enkidu. In the third and final volume, The Last Quest of Gilgamesh, the King sets out to find the secret of immortality. Zeman has undertaken extensive research to recreate the Mesopotamian world of Gilgamesh. 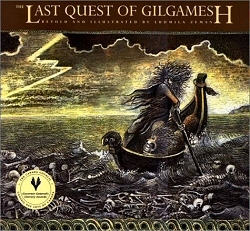 The Last Quest of Gilgamesh (paperback) - Amazon's online bookstore.